Elizabeth Archerd can’t contain a laugh. “You know something is going well when kids ask for the recipe for rutabaga stew!” she says. Uli Koester is the creator of the infamous rutabaga stew, a dish he’s shared with over 10,000 Twin City-area children in his role as director of Midwest Food Connection. The food outreach program that was started by The Wedge and its neighboring co-op, Mississippi Market, in 1993, has grown into a robust, professionally staffed non-profit that teaches kids about sustainable, natural, and local foods. Today, three additional co-ops contribute funds towards the program: Seward Co-op Grocery & Deli, Valley Natural Foods, and Linden Hills Co-op. The five co-ops make up eighty-five percent of Midwest Food Connection’s annual budget through a combination of direct funding and in-store credit. Each of the five co-ops nominates neighboring elementary schools to receive free lessons. Koester or another of Midwest Food Connection’s three certified teachers visits classrooms presenting seasonal lessons. Sometimes they bring camping cook stoves and produce a stir-fry before the kids’ eyes. Other times they bring seeds and tools and get the students outside. 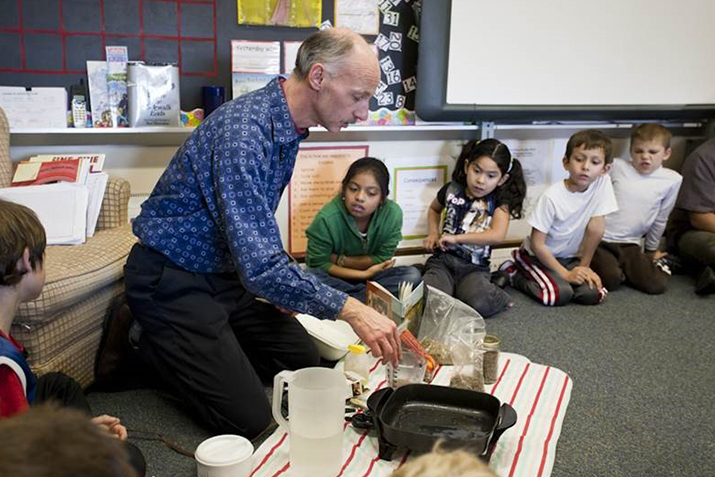 Nurturing curiosity about food is Koester’s goal for his class visits. According to Chad Martin, a second grade teacher at Northrop Urban Environmental Learning Center, part of the Minneapolis Public School District, he’s a big success. “Kids try things for Uli that they won’t try for their moms and dads,” he says. Martin has watched as every kid in his class sampled a turnip and tried to guess what it was – a cross between a carrot and potato was the group’s decision. “And they were in shock and awe that you could eat the leafy part of the plant!” he adds. Students are always delighted to eat things that came from Minnesota. Local foods, including wild rice and kale, are part of the fall curriculum. This year, Martin’s school and several others are getting a chance to eat food even closer to home through school gardens that Midwest Food Connection has started. They are redesigning the curriculum so that more time in the fall and spring are spent outside planting, harvesting, and learning about soil and insects.